Tucson Delayed Treatment Lawyers, Tucson Delayed Treatment Attorney | Russo, Russo & Slania, P.C. When you seek medical treatment, you’re placing your health and safety in your doctor’s hands, and you believe your case will be treated with attentiveness and care. You might already be scared about your injury or condition, and you certainly don’t want your health to get worse. Doctors, however, are not perfect and can sometimes neglect to treat their patients with the type of care they deserve. In some cases, they delay care of patients, which can result in further injury or pain, additional medical bills, and even death. If you or a loved one has suffered because a doctor delayed your care, you might be entitled to compensation for medical malpractice. The Tucson delayed treatment lawyers from Russo, Russo & Slania, P.C. can help you pursue a successful claim to recover money to pay for your medical expenses, lost wages, and more. Contact Russo, Russo & Slania, P.C. at (520) 529-1515 today or contact us online for a free evaluation of your case. Medical malpractice cases can be challenging. Most doctors do not want to admit guilt because they run the risk of losing their medical licenses. 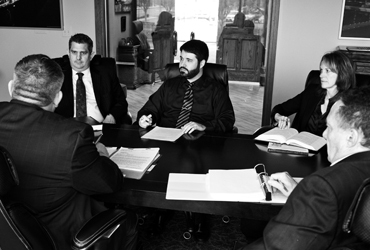 Often backed by powerful legal teams, they will fight against claims of malpractice. These cases are often lengthy and involve complicated legal procedure. Typically, to prove negligence and greater injury, other medical professionals are brought in to testify on the victim’s behalf, stating what they and other professionals would have done differently. It can be challenging to prove medical negligence in court, but seeking legal counsel can help you navigate these complicated legal procedures and bring negligent doctors to justice. A lawyer with experience in medical malpractice will be aware of all the laws surrounding your circumstances. A knowledgeable delayed treatment lawyer will use their resources and legal knowledge to prove negligence and malpractice by gathering evidence that will help you win your case. A skilled lawyer can also find medical experts to share their professional opinions that will support your claim, and they will help you prove that you were the victim of medical malpractice to get you the compensation and justice you deserve. Why Chose Russo, Russo & Slania, P.C. to Handle Your Case? Russo, Russo & Slania, P.C. has been proudly serving the community of Tucson for over 60 years. We fight fiercely on behalf of our clients, constantly working to ensure that they get the best results for their case. We have been able to get hundreds of positive results because we believe in putting our clients first. We understand that you are facing a number of challenges and that this time must be very difficult. You might still be trying to sort out medical bills and additional treatment, and the last thing you want to do is deal with complicated, drawn-out legal proceedings. Our team of skilled attorneys will handle everything so that all you have to think about is healing and moving past this challenging experience. It is our priority to ensure that our clients feel comfortable at all stages of the process and that their case goes as smoothly as possible. Because we are here to help you, your interests will always be at the forefront of our minds. The attorneys of Russo, Russo & Slania, P.C. have the necessary experience and legal knowledge to get you the compensation you deserve. Over the years, we have handled numerous delayed treatment cases with positive outcomes for our clients. Using this knowledge and experience, we will formulate a strong argument on your behalf. Our legal team will review your situation, consider the applicable laws, organize evidence, interview expert medical professionals, and build a strong argument that will help you get the compensation you deserve. We will stand up for you during the entire process and fight aggressively on your behalf. We believe in getting you justice and compensation. Doctors who have wronged their patients should not get away with it. They should have to face their mistakes so that no one else will suffer because of their negligence. Let us help you fight to protect yourself and our community. In order to recover compensation for these and other consequences, however, you will have to prove that your doctor was negligent, which requires numerous steps. Firstly, you must prove that the doctor performed with negligence, meaning that they acted in a way that other competent doctors would not have in a similar situation. This can be difficult because there are usually not any specific laws that state “in the case of x, a doctor must do y.” In the medical field, many of the decisions made are up to the doctors and their discretion, so it can be hard to prove that a physician acted in a way they knew could harm their patient. Secondly, you must demonstrate that the doctor not only failed to provide a proper diagnosis in time but that doing so caused further injury. You can claim that the delay of treatment caused greater pain, prevented the possibility of another therapy, or lessened the effectiveness of a treatment. A lawyer with experience in medical malpractice claims will be able to gather the necessary evidence to prove these elements and get you the compensation you need. Delayed treatment cases can be complicated. You need a knowledgeable and skilled legal professional on your side who will fight aggressively for you. At Russo, Russo & Slania, P.C., we want to help you put this troubling time behind you. Our medical malpractice attorneys will work nonstop to get you the compensation and justice you deserve. Call us at (520) 529-1515 today or contact us online to schedule a free evaluation with one of our delayed treatment lawyers.